go montana go! thanks brian bjortomt for starting the garden city flyers...pretty sweet to hear "he's a flyer" from dave spencer when i teed off leading the tournament today! this one is for everyone who has volunteered to make MONTANA DISC GOLF what it is today, and what it will be in the future! 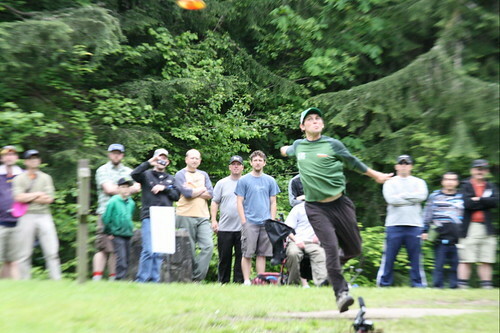 and thank you Christian... this is some amazing exposure for MONTANA DISC GOLF! I would really like to see some local coverage of this event, since a local athlete has done so well in it! ConGrats!! no matter what, you deserve that cloud nine-thousand feeling !!! Please guide our local hero, Christian Dietrich to an extremely FUN and EXCITING round today, and hey... 1050 round would be cool too. Please make sure your rediculis 'fro and flashy socks only distract yourself(maybe josh and brad too), please say the 'heck' out of view of all players (and cameras!) THANKS! 'got get paid' ... just not today !! GO CD!!!! ... now just need to get setup... I think I'll be glued to this thing 'till its over!! On Top Of The World- literally! All fingers crossed on your behalf, Christian! Thank you for giving us all such a thrill ...and thanks for your updates! Walk across that high wire one more time.. and you got it. How cool was it that the article above offered up..
"I came out of my first round yesterday in a great mood, and it really carried over into today," Dietrich said, toting a wide smile and his custom-made Mystery Ranch disc golf bag over his shoulder. Mystery Ranch & Co. must be bursting in celebration of having such a great light shining on their name and product! I don't think I've ever been this nervous while looking at my computer. 16 holes to go. It's going to be a while. I'm watching, the live scoring, the tweets, the PDGA live comments.. and the PDGA live PIcs!! This is all too cool..